Yesterday, Karen shared an amazing guest post about what older child adoption looks like in her family. 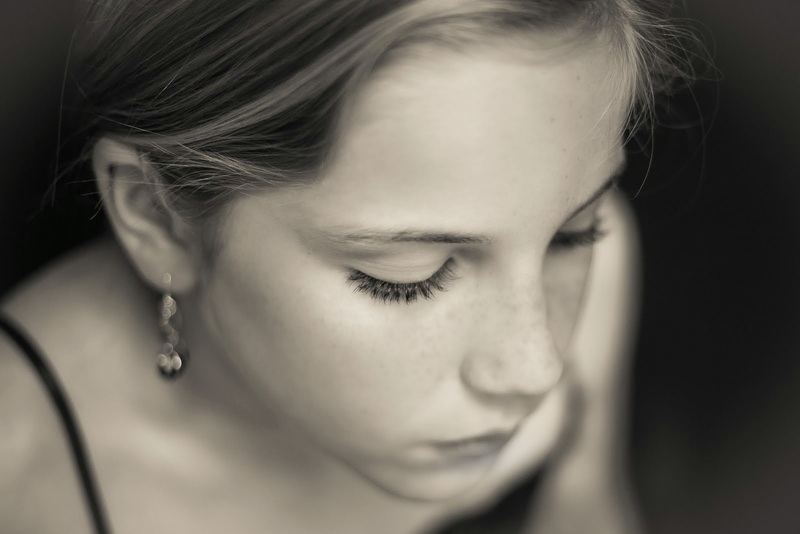 Karen shared that older child adoption is exhausting. Karen gave me so much to think about. With all the challenges of parenting my older adopted child, am I really trusting God, or do I suffer from the sin of independence? Does any part of my weariness come from trying to make this journey in my own strength? We need people in our lives who surface questions like that. Karen's post also caused me to think a lot about the kind of behaviors that fear triggers in our children who've come to us with a background of trauma. Remember 10 year old Cami rolling on the floor and whining at her sister's kindergarten graduation? Later that day, Karen discovered that all the talk about the end of school and summer vacation had put Cami in fight or flight mode because Cami didn't know what the terms end of school and summer vacation even meant. Fear can make our older adopted children behave in ways that mistakenly look like disobedience or immaturity. Remember when I posted the following story last year? Earlier that morning, Wenxin and I packed his lunchbox for his first day at Colorado Kids Camp. We filled his water bottle and put on sunscreen. We talked about how Daddy and I would go to the meetings for our conference and he'd go to camp. (Our other kids were at home with grandparents, but since Wenxin's only been home 10 months, we chose to bring him with us on this work trip to Colorado.) We planned to pick him up at 3 pm and then come home and swim together. So far so good. First stop: the Health Check station where they weed out any kids who might be sick. Wenxin tried his darnedest to fail the health check. Cough, sore throat, stomach ache? He had them all. On to his class: Wenxin refused to take a seat. In fact he stood, stiff as a board, in the middle of the room and mumbled loudly, "I hate everybody in here!" Our hearts hurt for him, but we were not surprised. Over the last 10 months, we've learned that certain situations trigger anxiety in Wenxin. A big one is places that look "institutional." This includes doctor's offices, schools, churches, etc. Context is everything. With no context, if you saw an eight year old boy refuse to take a seat, say that he hated everyone in the room and purposefully throw his name tag to the floor, you would probably think that his parents should impose swift consequences for his disobedient and disrespectful behavior. What eight year old acts like that? But what if you knew that only three years ago, this child had been removed from the only home he'd ever known and placed in an orphanage that housed 1000 kids? Would that make a difference? Could you see how getting in a line with a bunch of other kids and being dropped off at a place that looks an awful lot like an orphanage might push all his buttons, putting him into "fight or flight" mode? Could it be possible that even though this kid now has loving parents and life is good, this makes him even more afraid that he might somehow lose everything again, for a second time? First, Mike began to play with Wenxin. When I came back in the room they were quietly having a war, taking turns shooting each other with a bottle of sunscreen. The tears were gone and Wenxin was smiling. The next think I knew, Wenxin was sporting Mike's sunglasses and conference name tag. As he laughed and played with his dad, he relaxed. Play is a key to Wenxin's heart. Next, the Kids Camp director was quick on her feet and assigned a teacher to stick close to Wenxin for the whole day. She had that teacher come and get to know Wenxin while Mike and I were still there. Finally, I felt we might be able to leave. So I asked Wenxin, "Would you like to wear Dad's sunglasses when we leave, or can he have them back now?" Wenxin chose to take his seat in class, hiding out behind Mike's sunglasses, and we were able to slip out the door. Wenxin had a great "first day" at Kids Camp, and since then, he's marched right in like a big boy each morning. Lord, give us the grace to parent our kids from "the hard places" with eyes of informed compassion. Give us wisdom to see behind the bad behavior. Help us ignore the weird looks and insensitive comments from folks who just don't understand. Help us to be gracious to those people too, because not that long ago, we didn't understand either. Amen. Would you consider joining this site and becoming a regular part of the community at Death by Great Wall? 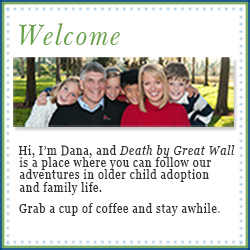 You can follow Death by Great Wall by clicking the join this site button on my sidebar. Or if you prefer, you can sign up to receive new posts by email. Coming up tomorrow: a little post on why I'd like to be in a medically induced coma for the rest of this week. It's true. Check back tomorrow to see why! "Lord, give us the grace to parent our kids from "the hard places" with eyes of informed compassion"
Yes. I'm praying this with you. 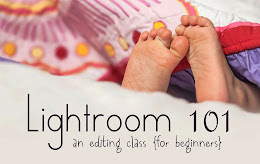 Thanks so much for linking up, it's so nice to read your words and glean from your wisdom. God bless you, friend. I love this post. I am adopting a 14 y/o boy and its easy for someone to judge him and think he's too old to act certain ways whether it's enjoying hte carousel at the mall or pouting over something "silly". I'm reading with gusto and enjoying the perspective. Oops - "is" not "it." I remember you from High school Dana. I think you were alot younger than I. Your blog is wonderful. Congratulations on your new son. He is beautiful. Your entire family is beautiful. You and your husband have hearts of gold. continue to blog. I am enjoying the read.